I have been busy reviewing (and analyzing!) the information which cousin Mike has so generously shared with us. And it has already led me to some interesting finds. For example, how many of you know we have an EICHLER connection? Well, thanks to cousin Mike, now we know we do! Johann/John KNAPP, father of our immigrant ancestor, Franz Adam KNAPP, also had a daughter named Elisabeth KNAPP. Elisabeth married John KLEIN/KLINE. They had seven children, including: Elizabeth, Adam, Betsey, Nancy, George, John and Catharine. I don’t know much of anything about the other children, but Adam KLINE I do know something about. Adam KLINE married Barbara SCHAEFFER/SHAFFER(I have seen it spelled several ways), on 31 Jan 1856 in Randolph, Portage, Ohio. 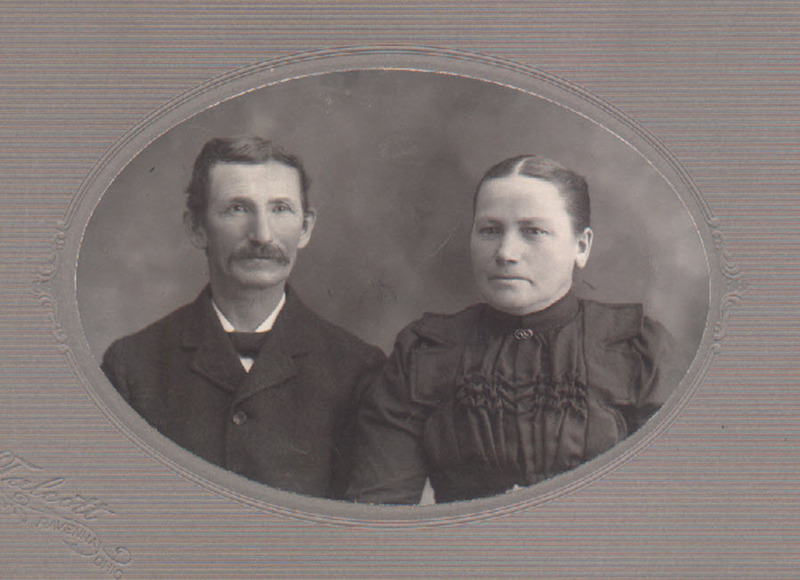 The couple had many children (about 14, I believe), but their oldest child, Eva/Eve KLINE, born about 1857, married a man named Adam EICHLER in 1878. This couple had nine children, many of whom have descendants still living in the Portage County, Ohio area today. Which brings me to something I ran across this week on ancestry.com that I found fascinating and just had to share. A big shout of thanks to Tim DeFrange, who lives in Kent, Ohio, for being willing to share his genealogical research into his wife’s EICHLER connections. Tim does not happen to be an EICHLER by blood – he was just lucky enough to marry one – his lovely wife, Linda, as he writes in his history. I can relate to that – I am not a KNAPP or a KLINE by birth, either – I was just lucky enough to marry into the clan and write about it! My husband, Mark, remembers Tim from his days at Roosevelt High School. Tim was a few years ahead of Mark in school, but remembers Tim and his siblings. Tim has put together a wonderful two-part historical sketch of the EICHLER clan’s origins, which also talks a lot about the KLEIN/KLINE connection. It has some wonderful photos and stories I just knew you all would enjoy. I have posted Tim’s Eichler Pictorial History: Part 1 and Part 2 under the Document Galley tab, right near cousin Mike’s Wise Guys archive. I hope you enjoy reading it as much I did – and a hearty thanks to Tim for his willingness to share his research with us. I know I have said it many times on this blog, but I really do believe genealogists are some of the most generous and giving people on the planet! Thanks, Tim – and thanks, Mike – for helping to bring us all together to learn more about our fascinating past. This entry was posted in DeFrange, Eichler, Family History, Weiss, Wise and tagged DeFrange, Eichler, Kline/Klein, Knapp, Weiss, Wise. Bookmark the permalink. Hey! Looking up my family, do you think its possible I might be part of that family? The Eichler name has been in my family for generations.